← News Flash: Obama Endorsed By Conservative Democrats Nunn and Boren? Um, Woah! UPDATED: Joe Andrew’s Letter For Obama! 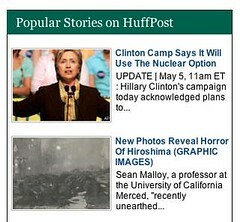 Too Clever by Half – HuffPo Headlines Go Nuclear! o hai! Sometimes, a screenshot says it all. Like this one, which has 2 popular storries on the Huffington Post (sigh)…one about Hillary Clinton’s fight for the delegates to win the nomination…the other about a horrible human tragedy with lots of dead people. Memo to newsniks and the like: Watch it with the cutesy clever “o hai me so smart” headlines…you never know where they’ll end up.